When the New Organon appeared in 1620, part of a six-part programme of scientific inquiry entitled 'The Great Renewal of Learning', Francis Bacon was at the high point of his political career, and his ambitious work was groundbreaking in its attempt to give formal philosophical shape to a new and rapidly emerging experimentally-based science. Bacon combines theoretical scientific epistemology with examples from applied science, examining phenomena as various as magnetism, gravity, and the ebb and flow of the tides, and anticipating later experimental work by Robert Boyle and others. His work challenges the entire edifice of the philosophy and learning of his time, and has left its mark on all subsequent philosophical discussions of scientific method. 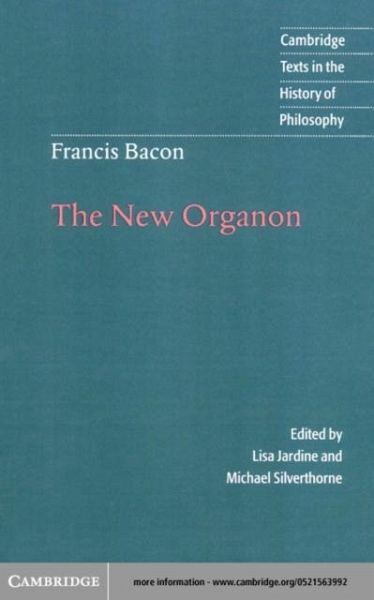 This volume presents a new translation of the text into modern English by Michael Silverthorne, and an introduction by Lisa Jardine that sets the work in the context of Bacon's scientific and philosophical activities.